Tune in and listen to Dave and Justin discuss things that may never happen. But what if they did? PC user: Right click and choose "Save Link As"
MAC user: Right click and choose "Download Linked File"
What If you could be a part of the "What If? Podcast"? NOW YOU CAN! If you have suggestions for topics that we could discuss on the show, or if you have comments about previously discussed topics, or if you want just to write in about anything at all, then all you have to do is fill out the submission form. 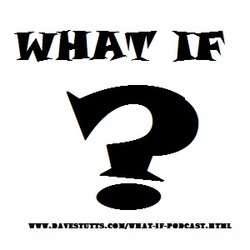 Welcome to the new What If? Podcast! This is a project that my friend Justin and I started after many hours of sitting around and discussing countless "What If" situations. Have you ever wondered what you would do if you won a million dollars? How would you handle meeting an alien? What if you woke up tomorrow with superpowers? All this and more to be discussed on our new and awesome WHAT IF? PODCAST! Whether it be pop music, orchestral works, or digital scores for visual media, the right score can change everything.